Supergirl gears up for the season finale by starting to pay off the established arcs that have developed over the course of the season. This season has been a bit of an enigma in that so much has happened while so little has happened. I refer to life changing events in the lives of the characters apparently having very little emotional impact. The most egregious of these is Kara learning that a large number of her people -including her mother- are still alive. I’ve mentioned before that there’s an emotional bankruptcy to this reveal because of the lack of emotional heft behind Kara’s reaction. Bizarrely it isn’t because the episodes are burdened by an overabundance of plot so it just ends up looking like Kara isn’t phased by this life changing news. The problems associated with the Argo City plot carry into this episode with the location being treated as a means to an end in the context of the events of this episode. Argo City only seems to exist to keep Kara and Mon’El away from what’s happening on Earth rather than serving any real function on its own. 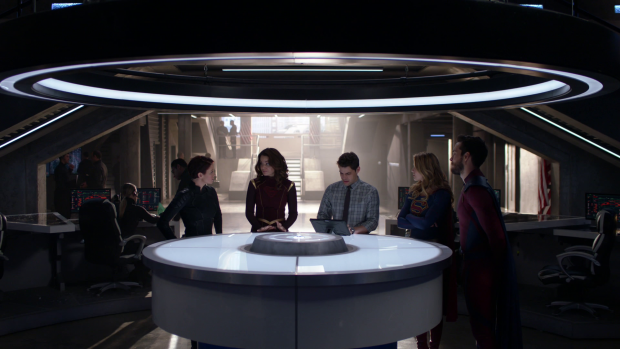 The scenes containing Kara, Mon’El and Alura are best described as busy work as they work to get to the bottom of Serena’s betrayal in the previous episode. The lack of perceived urgency to these scenes really hurt the episode as a lot of momentum is lost by the three of them seeming to be in no hurry to find a way to get to Earth. Come to think of it, failure to build urgency and suspense has been a problem that has plagued many of the recent episodes. There are a number of high stakes problems that the characters have to deal with but they aren’t treated with any degree of significance so the threat value attached to them is almost meaningless. There is one moment that suggests the situation is more important than personal feelings. This comes after Mon’El and Winn have an interstellar heart to heart about Mon’El’s feelings for Kara while she and Alura look on. 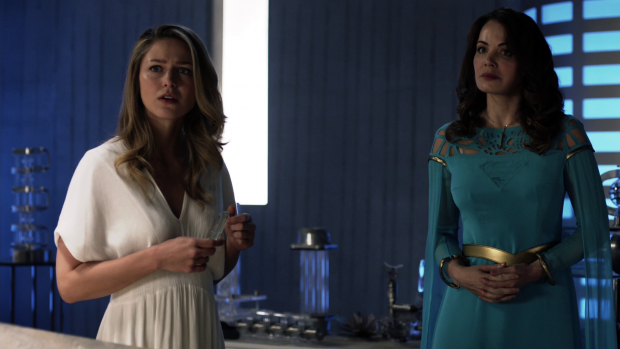 Alura asks Kara about her feelings for Mon’El and resolves to have a conversation about it when the current crisis has been dealt with. Erica Durance’s delivery isn’t the best here so the intended gravity doesn’t come across but the sentiment at least makes sense in context. There shouldn’t be time for deep and meaningful conversations as full focus has to be on the current situation. It’s a good character moment as well because it shows that Alura picks up on her daughter’s emotional state to some degree and reminds us that they still have so much to catch up on. This busy work is echoed back on Earth with their efforts being coordinated by Winn who helps them open a portal so that they can return. 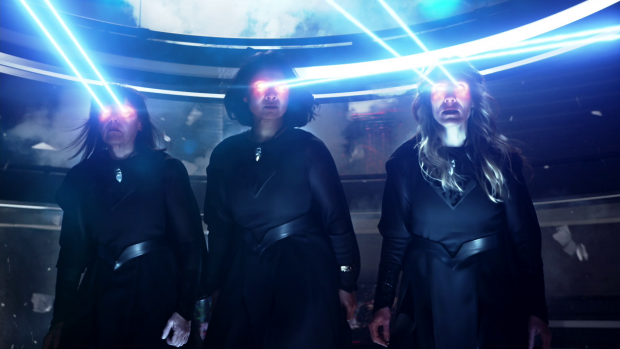 Naturally this coincides with the three Kryptonian witches attacking the DEO which does create some jeopardy as everyone who has super powers is conspicuously absent at that point. It would have been more intense had there been more than 3 people in the building but I got the sense that Winn was in real danger. The same doesn’t apply to Alex but it rarely feels like she is in any danger. There is one casualty in the form of Agent Demos (Curtis Lum). He has been a background fixture in a number of episodes and there is a quick attempt to show a friendship between him and Winn. It doesn’t quite work because it is such a transparent attempt to manufacture a reason for his death to mean something though Jeremy Jordan and NAME did work well together in that scene. I would have liked to see more of these characters interacting as given the time it would have been a fun dynamic. Kara, Mon’El and Alura’s arrival on Earth comes with very little fanfare and it certainly doesn’t feel as if anything is really being sacrificed. The portal does fail after being used but Argo City is far from inaccessible at this point so it just comes across as an unnecessary complication that can easily be countered. Alura on Earth doesn’t really make much of an impact though her introduction to Alex is a good moment. It comes across as Alura fully accepting Alex as part of her family as gratitude for taking Kara in. Kara’s excitement when introducing them is infectious as well making for one of the few genuine emotional moments in this plot. Serena and her companions are about as bland as it comes for villains. Their plan is well laid out and makes sense but they never come across as threatening despite their considerable strength relative to those they are fighting. There was a real opportunity to play with the cat and mouse aspect as they searched the DEO for the needed blood samples. Kara using the hologram of her mother to sneak around and assess the situation is a clever touch and her tactic of usin the hologram as bait to activate the portal was clever but other than that there was no real sense that the DEO was under siege. It also flies in the face of the gun control point that the writers attempted to make last week when a trio of invincible Kryptonians attack the DEO and are combatted using Kryptonite bullets. If anything it makes a case for the DEO being armed with lethal weaponry if this is an example of the threats they routinely face. Their plan to terraform the Earth to turn it into New Krypton is pretty standard as far as these things go and doesn’t start to feel like a threat until towards the end of the episode. Once the earthquakes begin and the city starts to be torn apart some much needed scope is introduced making this feel like a problem that is far reaching and in need of being solved. I find the prospect of Reign being reborn independently of Sam while still being connected somewhat ridiculous as it feels like the writers want to create a situation where Sam can still appear in scenes while Reign is still active meaning that both personas can still be participants in the story. Setting up Sam as the key to defeating Reign makes some sense though this would have been more effective if they were still sharing a body as this episode makes it clear that harming Reign will affect Sam positively. The Sam and Ruby relationship remains as interesting as ever and creates reasonable personal stakes for Sam. She is motivated to stop Reign because it will save both the world and her daughter which echoes everything she has said about Ruby being her entire world and how willing she is to sacrifice herself for the benefit of Ruby’s well being. The scenes they share in this episode are really low key and genuinely feel like a lived in mother/daughter relationship. I suspect that Ruby will factor into the resolution of the Reign story significantly as her relationship with Sam is one of the emotional pillars of this season. 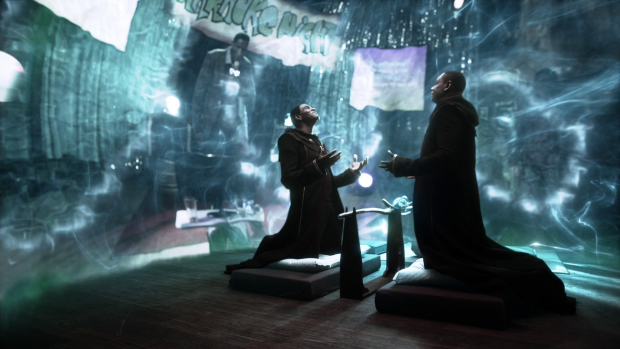 J’Onn and M’Yrnn spend most of this episode in their private plot as they perform the ritual known as “The Reach” which involves transferring all of M’Yrnn’s memories and experiences to J’Onn. It feels somewhat sudden as it was only mentioned last week for the first time so it feels less like something that the show has been building towards but that doesn’t make it any less effective. On a visual level it’s really impressive with the memories displayed all around them as they discuss the process. M’Yrnn makes it clear that it will be painful at times because not every experience has been positive and J’Onn will end up reliving the genocide of his people from M’Yrnn’s perspective. This will also include his imprisonment and the profound sense of hopelessness he felt during that time. Basically this process makes them closer than they ever have been while also functioning as a prolonged goodbye signifying the end of that relationship. It’s very powerful and a solid testament to how well this relationship has been developed over the short period of time M’Yrnn has been on the show. There is also a smaller interaction with Alex where M’Yrnn makes a point of saying goodbye to here due to how close they have become. It’s a nice moment that is well acted by all concerned. The ritual appears to have been interrupted when the earthquakes start and M’Yrnn offers to fix the problem by bonding with the Earth in some way. He sees this as the final gesture of a father protecting his son and makes clear that he is doing this to save his son”s home. J’Onn doesn’t want to let him do it but M’Yrnn sees this as the noblest of sacrifices and insists on carrying this out. It’s not something that J’Onn can disagree with and opts to help him have a dignified ending protecting those he loves. How this will play out remains to be seen but it’s really profound so far. There’s a real risk of the finale being n underwhelming experience because of the lack of weight attached to the current narrative. It feels like the show has shifted gears to being more plot driven than character driven and it has negatively impacted the overall quality. This season started out really strongly with a focus on how characters reacted to a given situation while delivering an emotionally resonant villain story. The shift to focusing on plot with superficial characterisation has made everything less engaging. I fully expect that M’yrnn’s sacrificial moment will be moving thanks to strong work done making the build-up impactful if rushed but I’m wondering what else will be taken from this. I’m unable to predict how Alura will be used and if there is a plan to kill her which will turn her return into a cheap stunt to create despair for Kara. Will Argo City remain a place she can just go to whenever she likes? If so then what motivates her in future if she can be with her people. I am most interested in where Sam and Ruby will be left when the dust settles but even that part is less compelling than it was. A mediocre episode that brings the problems of the recent outings and fails to resolve them. In many ways they are compounded by continuing the plot driven direction at the expense of character driven storytelling. Kara and Alura still have no baseline relationship outside of one good mother/daughter interaction and the Argo City scenes feel like little more than busy work. Similarly Serena and her companions are really underwhelming as villains with all sorts of missed opportunities to establish their threat level such as failing to recognise a potentially tense and effective game of cat and mouse within the DEO. The Sam/Ruby relationship is still strong though separating Reign and Sam in body while retaining a connection comes across as something of a cheat that lessens the effectiveness of them being connected as there is less risk associated with defeating Reign. I’m still convinced that Ruby will somehow be the key to Reign’s defeat in some way. 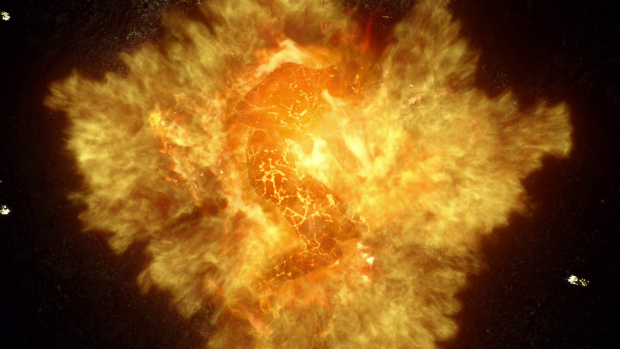 J’Onn and M’Yrnn’s plot in the episode is really well done. Journeying through M’Yrnn’s memories as they are passed onto J’Onn is really powerful and highlights that life has its share of bad to counter the good. Having this build up to M’Yrnn’s final act being a sacrificial one where he protects the planet that his son calls home will be an appropriately moving ending to this relationship.